Helena never intended on being turned into a werewolf. The one night stand was her stupid mistake, so she’d deal with it and make sure it didn’t affect her career or her life. Can love keep his humanity from slipping away? An Alpha Wolf too wild for love… Being a werewolf who could read minds won Sebastian no friends in a world full of secrets. As Ethan focused on his plans for what, and who, might be left behind once he righted the heart wrenching wrongs of his past, a beautiful new vampire in town threatens to distract him from his mission. After a lifetime of lies, he didn’t know who he was anymore, so how could he ever be what she needed? Vince grew up believing he was only part werejaguar… Found out by the community he’d been trying to hide from, his eyes are opened to everything he’d ever believed about himself, all of it a lie. 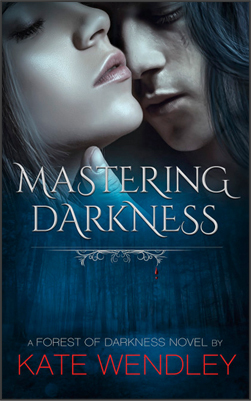 Mastering Darkness: A Master Vampire losing his grip on his humanity. 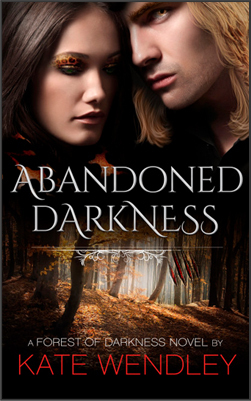 Abandoned Darkness: An Alpha Wolf too jaded for love. 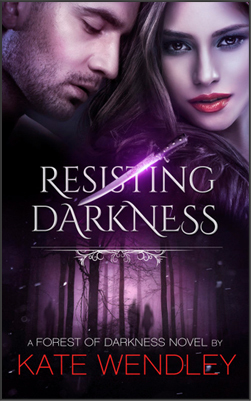 Resisting Darkness: A powerful vampire ready for vigilante justice. Welcome to the Forest of Darkness site! All books can be read as standalone novels and are available on Amazon, Kobo, Barnes and Noble, Smashwords, and iTunes, and don’t forget to check me out Goodreads. If you’d like to know when new books are available, please sign up for my newsletter on the contact page. And visit my blog for reviews on Books, Movies, TV Shows and more. Thanks for checking out the site and have a great day! Kate Wendley writes paranormal romance for those who love drama. Vampires, werewolves and more contend with hot tempers and incredible powers while bravely navigating the mysteries of finding love and acceptance in her urban fantasy series, A Forest of Darkness. Set in the City in a Forest, Atlanta, GA, it make you think twice about how well you really know your friends and neighbors. When Kates not busily writing about things that go bump in the night she enjoys watching sci-fi, campy horror movies and stand up comedies. Mercedes ‘Mercy’ Thompson is a walker, meaning she can turn into a coyote in the blink of an eye. Being less powerful than the werewolves and vampires in town, and being the only one of her kind that she knows of, she tries to keep a low profile running a mechanic shop for older foreign cars. But when a newly turned werewolf shows up looking for a job, she can’t help her curiosity at how this teenager, ‘Mac’, came to be gaunt, homeless and without a pack. His skittishness doesn’t help her get to the bottom of his story, though, so she tries to give him some time to open up to her. Mercy soon learns time isn’t something Mac has. Mac’s girlfriend is already dead, killed by whoever also attacked Mac and turned him wolf, and now they were back to collect their prize. After Mercy turns coyote and attacks Mac’s would be abductors, hoping to distract them so Mac could get away, she never dreamed she’d actually kill a werewolf. The man was dead, though, and now Mercy had to call in the local werewolf pack to help clean up the mess. While Mercy tries to keep her head down and make nice with the local wolf Alpha, Adam, Mac’s story raises alarms for wolves everywhere. Drugs are being tested on newly turned wolves that could render werewolves everywhere completely helpless. When Adam is eventually attacked and left for dead, and his teenage daughter is kidnapped, Mercy becomes firmly embroiled in their world in her attempt to save their lives while not losing her own. Patricia Briggs weaves a tightly woven world of werewolves, vampires, fae and more that will keep you glued to the pages to find out what happens next. This book is mainly a paranormal mystery, but there are hints throughout of budding romance, or even a rekindling of an old romance. Since I’ve read more of this series already, though it’s been a few years, I can tell you the romance continues to develop in future books, but always with a healthy dose of danger. Patricia Briggs is an excellent writer, the action never slowing and her world rich with fully fleshed out details. A must read for paranormal fans!